Parang La: Trekking from Spiti to Ladakh Along the Ancient Nomadic Trade Route ~ The Wandering Soul's Wander Tales.. Despite nearly losing one hiking boot to its flow just minutes before, crossing the thigh-high fast currents of the Pare Chu River at Norbu Sumdo felt strangely exciting. After all, there's only so much walking on river bed that one can take. Walking through dry valleys for days after crossing the high pass, even something as dangerous as a fast flowing river seemed like a welcome obstacle. Parang La is a strange trek, long and monotonous often times but it redeems itself with consistent days at high altitudes of above 4000m and mind-blowing views of Tso Moriri towards the end. The incredibly blue waters of Tso Moriri, one of the highest lakes of Ladakh. Ancient trek routes connecting remote lands always held a great fascination for me. Ever since I heard of one such historic route that connected Spiti to Ladakh across Parang La, I’ve wanted to get on that trail. The nomadic people of Changthang used this route in the earlier days extensively to attend the La Darcha trade fair in Spiti where the Changspa nomads came mainly to barter wool and barley in exchange for salt. Even today, many locals use this foot trail as the fastest and cheapest way to get across between Spiti and Ladakh. I was more than excited to be experiencing a slice of the local way of life in the mountains. Just like the Chadar becomes the highway for the people of Zanskar to reach Leh during winters, this route connects the people of Spiti and Ladakh during summers. Arriving at Kibber(4200m) with two other hikers, our guide and his support team of five, I stood in front of the ominous notice board warning hikers that the trek can get very dangerous after September 15th. Unprepared as I was and breathless already after barely a minute’s walk on flat ground (that’s high altitude and low oxygen at work! ), I nervously made calculations in my mind if we’d be crossing on time. Thankfully, we were almost 3 weeks early before the open season ended. Camping in secluded locations on moonlit nights is nothing short of magical! Over the next two days, we walked along gradual trails where we came across several fossils belonging to the Tethys Sea and enjoyed clear views of stunning Mt.Kanamo towering above the landscape. When the time came to cross the 5500m high pass, we got down to a deep gorge and climbed along a punishing moraine to reach the basecamp where furious winds ripped apart our tents for an hour before subsiding. Crossing the pass turned out to be a decent affair, the insane cold before sunrise and the oxygen deprived high-altitude being the only deterrents but nothing too unmanageable for an experienced hiker. The descent towards the other side, however, brought a large swathe of snowfield and plenty of glacial streams. Hiking on top of brittle ice formations over water channels crisscrossing beneath our feet turned out to be quite tiring and often times harrowing but the lure of a distant campsite along the riverbed kept us moving. What we didn’t realize was that much like a mirage in the desert, our campsite would never arrive despite seeming like it’s just around the corner. Looking for greenery so the donkeys could graze, we couldn’t stop just anywhere by the river. We walked and walked on the dry riverbed until we found a small patch of green almost after 9 hours since we started hiking that day. Tired, we collapsed into our tents thinking the worst was behind us. Normally, the toughest days on any trek are the summit or pass-crossing days but not on this one. We would be tested mentally over the next 7 days but for now, we reveled in the glory of safely crossing the 18300ft high Parang La pass, a mighty wall between the two legendary regions. The Pare Chu River and the vast riverbed that we walked along for what seemed like ages! Over the next few days, we walked endlessly along the riverside in the valley between the mountains. The days were monotonous and mentally taxing for there was little change in scenery apart from more brown mountains and pebble-filled riverbed. The only thing that we were looking forward to, was reaching the shores of beautiful Tso Moriri, one of the world’s highest lakes at an altitude of almost 15000ft! When we reached the shore, I couldn’t resist the temptation to camp an extra day by its verdant shores observing the wildlife and soaking in the greenery around. The best part of this trek was definitely hiking in the incredibly scenic Changthang region of Ladakh, one of the very few regions in Ladakh with greenery and abundant wildlife. The Bar Headed Geese that fly higher than Mount Everest roosted right next to our campsite and Kiangs, the endemic Tibetan Wild Asses of high Himalayas, strayed close examining the outsiders in their territory. I also enjoyed stalking the curious and very cute Marmots, which are not used to human presence at all in this region. 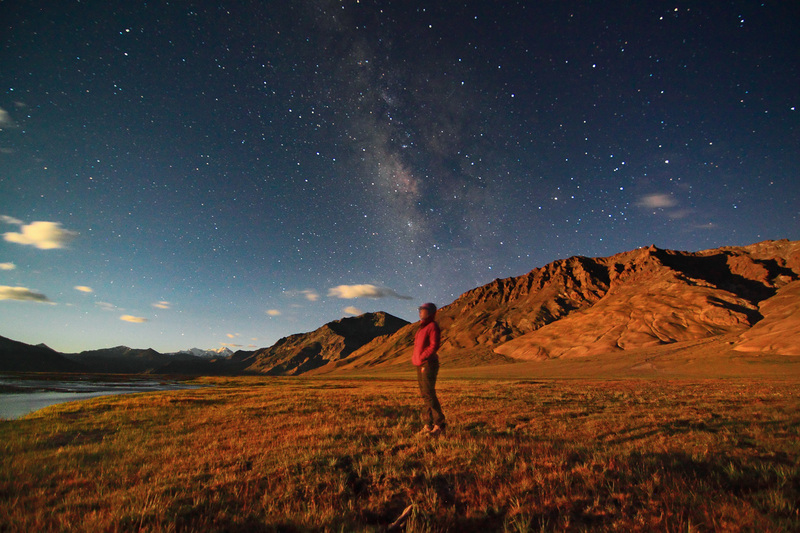 I woke up to gorgeous sunrise views at farthest end of Tso Moriri and warmed myself around a bonfire at moonrise watching the many glacial streams light up even as the milkyway showed bright in the night sky. On the last day I hiked almost 20kms along the shores of Tso Moriri to reach the village of Korzok on the other end. With this, I had explored the entire length of the two most gorgeous lakes of Ladakh; I had driven 40kms all across the length of Pangong Tso in India and walked across the length of Tso Moriri from one end to the other! Now having walked, flown and driven to Ladakh on different trips, the only other means of transportation left to reach the roof of the world was cycling. Perhaps, it will be the next adventure that’ll see me arrive in Ladakh for the 7th time! But for that time, I was more than happy to treat my eyes to some greenery after almost 2 weeks of barren landscapes of Spiti and Ladakh. Between the lush greens, however, flashes of those empty landscapes shining bright on moonlit nights will surface every so often and I’ll go running back to the very same strange place that feels like home! I was invited to join this trek with Great Indian Outdoors (GIO) which happens to be one of the very few companies offering this trek in India at a reasonable price. The equipment provided was excellent and I would even say this was a luxurious trek in terms of facilities and comforts provided when compared to many other treks I have been on in the past. Two reasons I can highly recommend GIO for your next Himalayan adventure are one - they strongly believe in small group adventures (which means no 30 member teams!) and two - they have plenty of fixed departures which solo hikers and small groups can join to avoid sky high costs. Thanks guys, yeah, it was pretty good trek with absolutely very few people on the whole trail. This came at the right moment when I was getting weary of crowded campsites and trails. Definitely try to do this trek someday. Thanks Neelima for the wonderful post. Had been to Ladakh and Spiti earlier but trekking all the way to Ladakh from Spiti, never thought about it before. I am in awe of your travel photos and the offbeat ways in which you explore the soul of a place! Thanks Preeti, exploring a place through the nature is what I've always wanted. I'm glad to be able to get back to that kind of exploring. I am in awe of your images and trek description. Such an unusual route to trek !!! awsome girl. I m totally fascinated and inspired and would love to do this trek route in near future. Do take a look at some of my photography images taken during the Kashmir great lakes trek and ladakh bike ride covering 4000kms for 25 days on my blog gallery at http:www.thetravellingtoes.com/gallery. And keep the posts coming. Luv them n a huge fan of your photography. I m glued to your blog! Hope to trek wd you sometime soon. Thanks Anupa, was very happy to be on a route that doesn't see crowds flocking, which is unfortunately happening a lot on most of the Himlayan trails these days. 25 days in Ladakh sounds amazing, were you riding the bike yourself? Will check out your gallery for sure. When you mentioned Bar headed geese roosted near your campsite and Kiangs, Marmots gave you company, I felt an adrenaline rush. The wildlife you saw are endemic to that area, only bar headed gees rarely we get to see near Pune during winters. After reading this post and account of Kugti Wildlife Sanctuary trek, I can say it is very demanding trek Neelima, physically as well as emotionally. We only see those beautiful pictures sitting comfortably in our chairs, but the effort you take to explore and capture this beauty is remarkable. I didn't know Bar Headed Geese could be spotted around Pune. I have seen all these endemic wildlife before on my roadtrip to Tso Moriri but yes, camping next to them is definitely another experience. And yes, it's a bit of an effort, exploring outdoors but one I absolutely enjoy doing. Wow, that's wonderful. I'm thinking of Pin Parvati for next year, was almost about to join Pin Parvati trek with GIO before Parang La got finalized. Do post a link to the pictures if you can, I'll try and upload more pictures from this trek soon. Please have more photos from the trek . Marvellous pics of starry nights and moonlit mountains. Did you carry tripods during the trek and what was the approx. exposure? Thanks Arijit! Yes, I always carry a portable hiking tripod with me. The exposure was anything between 60 seconds to 300 seconds. Fabulous photos! I found it hard to tear my gaze from the one with the fading Milky Way in the background. A two week long trek sounds interesting and challenging. Hopefully I'll get to try it sometime. Brilliant post and even more stunning photos. The one with the "Nomadic Changspa returning to their lands after successfully finishing a trek to Spiti" is staggeringly capturing the giganticness of the mountains. This trek is definitely on my bucketlist now along with Pin Parvati! Thanks so much! Excellent post! Can you please let me know whether crampons/micro-spikes after the Parang la for a small stretch walk on glacier are needed or not? And any idea about the transportation options from Korzok till Upshi via Mahe village? CONTEST: Win 2 Himalayan Treks in India with GIO!